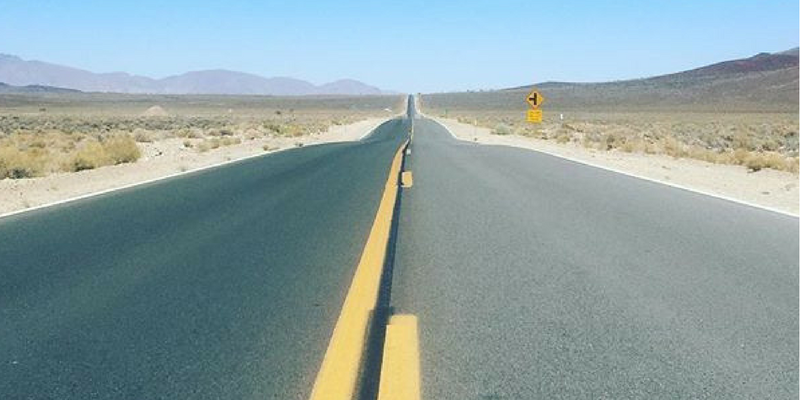 Death Valley is a far cry from the conventionally thought California. None the less, Its alien landscape offers unique beauty, while its vast vacant spaces allow for self reflection and wonder. 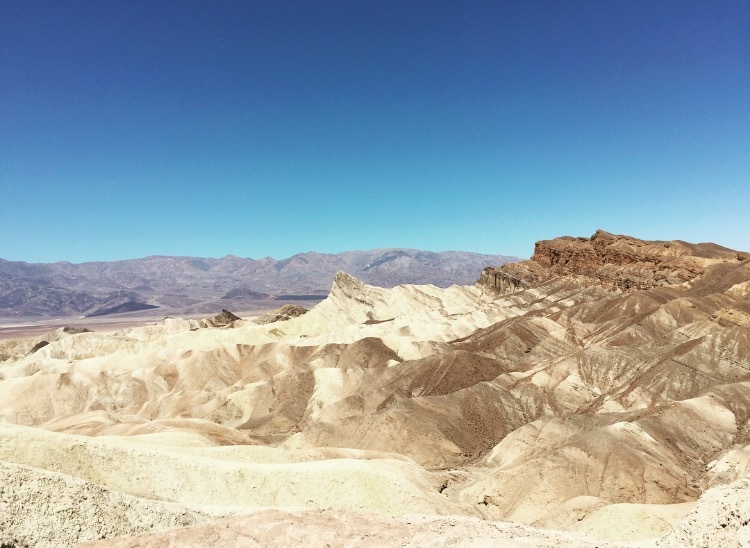 One of the most popular destinations within the park, Zabriskie point is just a 15 minute drive from Furnace Creek. Entering the park from its east side, you’ll even drive past on your way to the Inn. So really, there’s no excuse for missing this gem! 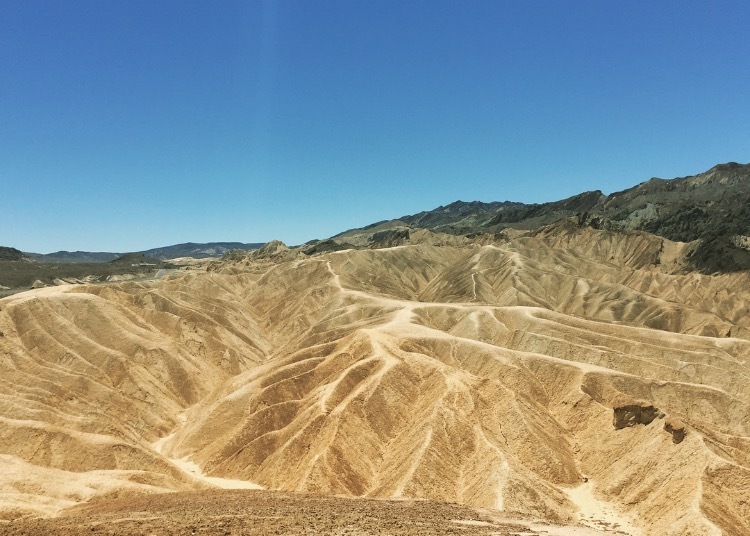 Which, provides an excellent first look at the bizarre artistry of Death Valley. From a small car-park, just off highway 190, head up hill to the overlook. Surrounded by a small wall. Here, you’ll find several bench’s (to take in the view from) along with information plaques on Zabriskie’s famous ridges. These eroded ridges have a magical sense of fluidity. Basking in the deserts scorching sun, the reflection of heat waves off the rocks allows them to glisten as though they’re a river running down stream. The real star of this spectacular rock formation however, is its stunning colour palette of oranges, reds and hints of gold. Which, is most breath-taking in the morning or late afternoon. Bad Water Basin is the lowest point in North America, with an elevation of 282 ft below sea level. 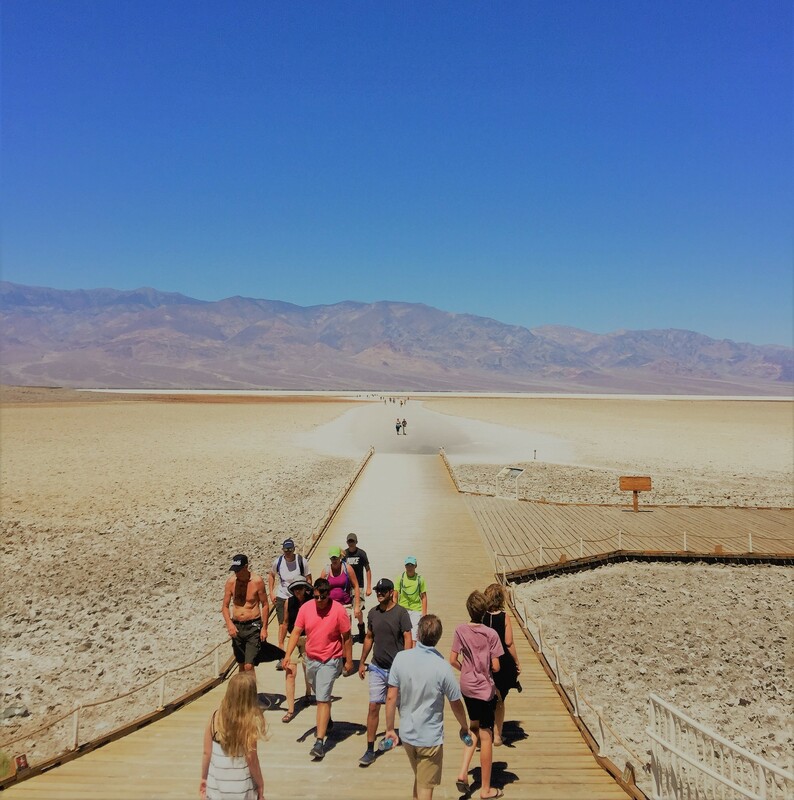 This fascinating destination, like so much in Death Valley, really has to be seen to be believed. The salt flats cover nearly 200 square miles. 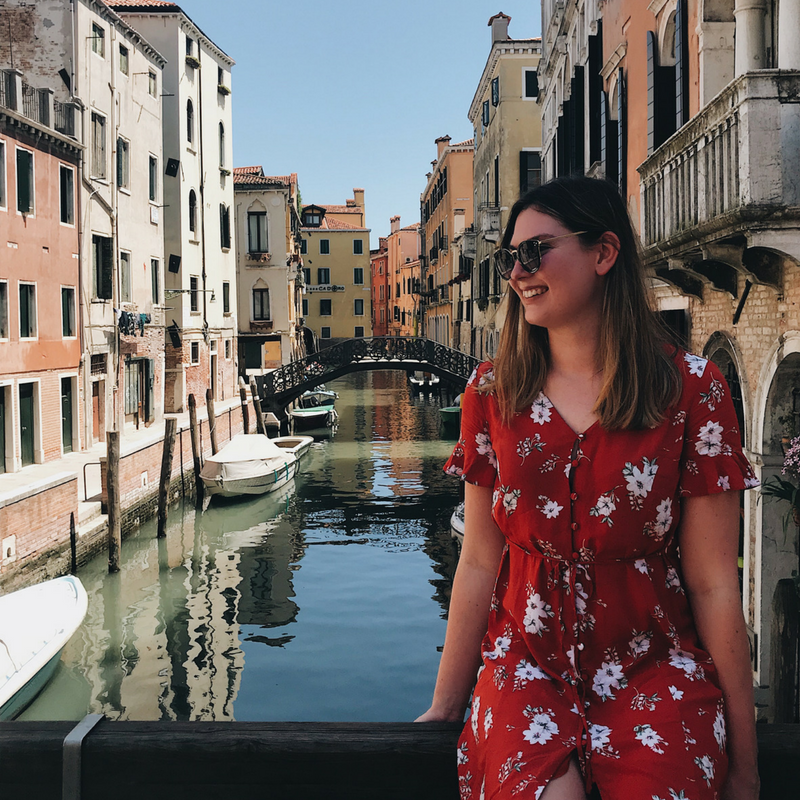 As such, stepping out onto the broad walk, you’ll instantly be overwhelmed by the sheer scale of the basin which, stretches out as far as the eye can see. Bad Water Basin is easy to located. Its sign posted, reasonably effectively, from Furnace Creek. From which point, its only about a 15-20 minute drive. When driving to Bad Water Basin from Furnace Greek, it’s highly worth your while to take the short scenic loop know as artists drive. This wonderful route takes you up close to the Black Mountains which, alone is a heart-stopping experience! The road slices effortlessly through the rocks, immersing you in the centre of the desert. The main feature of the route however, is the aptly named Artists Palette. Here, over 1000’s of years, the clay rock has oxidised producing a wonderful array of colours. From hues of purple and pink to blues and greens, it truly looks like an artists palette whilst, ironically also being the remarkable creation. 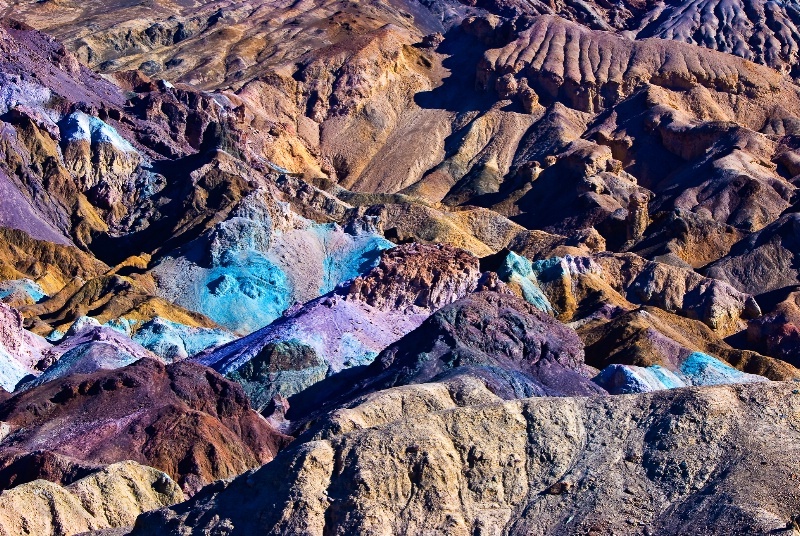 While Death Valley mainly consists of an abstract rocky landscape. There are several different areas which are dominated by Sand Dunes. 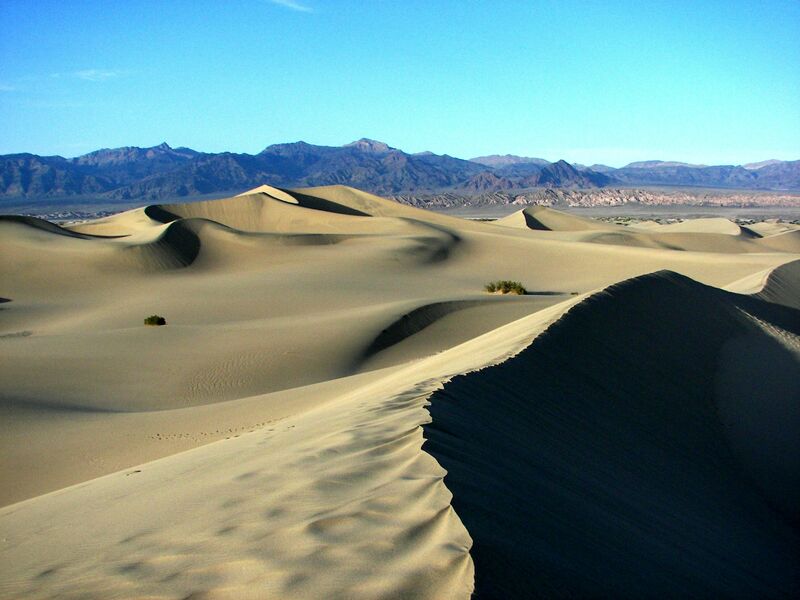 The most accessible, and arguably most impressive, is the Mesquite Dunes. Climbing to the top of these seemingly untouched dunes, makes you feel like an early adventurer… You could be fooled into thinking you were in the Sahara if not for the mountains looming in the background. The best time to visit the Dunes is upon sunrise. As they are said to provide the most astounding view… There are certainly worse places to spend the early morning. 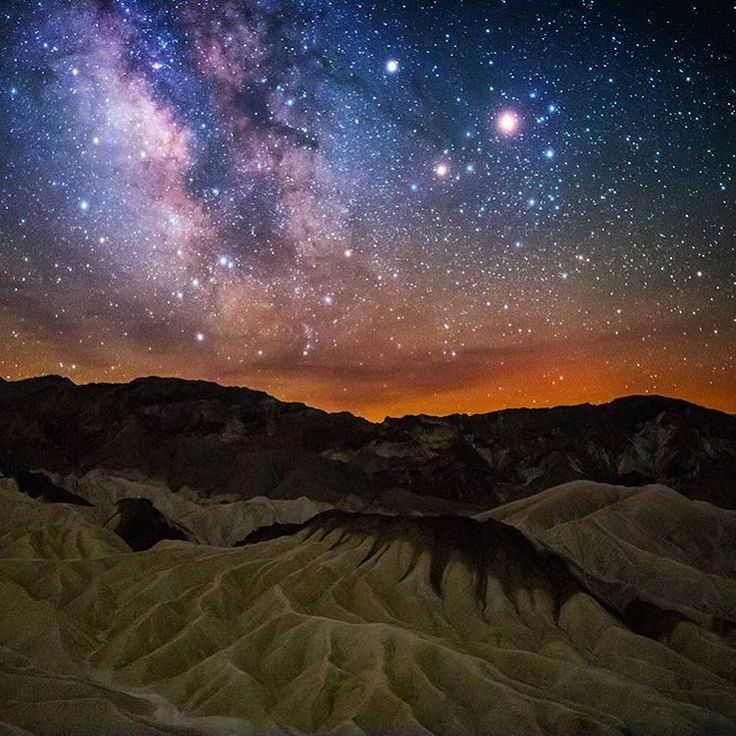 For me, the top thing to do in Death Valley is to stay up late and look at the stars. This can be done from anywhere in the remote park! However driving as little as five minutes away from Furnace Greek, the little to no light pollution allows you to see the night sky with miraculous clarity. Personally, I found it overwhelming. Never before had I seen something so beautiful. A feeling which cannot be capture on film or in photographs. This is a fantastic way to end a day of exploring in the park. Whats more, it perfectly sums up the wondrous and spell binding nature of Death Valley. Look at the colours. They are mesmerising. The only time I have seen colourful earth like that was in Mauritius at the Seven Coloured Earth of Chamarel. And that night sky is stunning. Thank you for the pointers. I shall be returning for tips when I do get to the Death Valley. 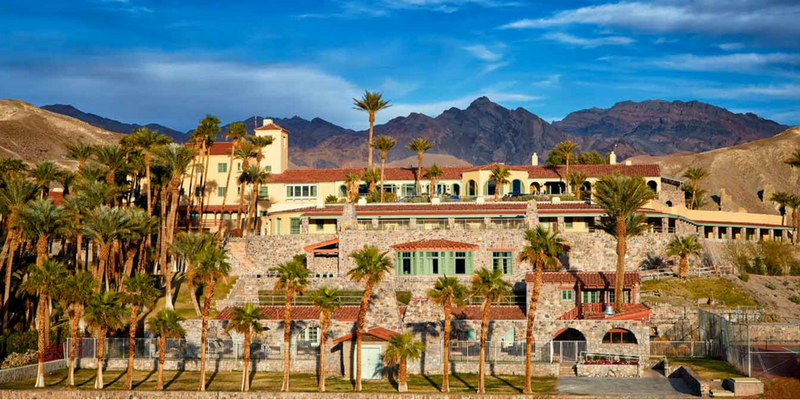 Death Valley is on our list too. My friend recently visited and was excited about the sand dunes and stars. Now I can see what he was talking about. Great shots! Your photos hardly look real they are so beautiful! I cannot believe how colorful some of those rock formations are. What an amazing place to explore! I haven’t read much about Death Valley before, so this was fun to learn something new. I can’t believe all those stars! Can you camp in this area? When is a good time to visit? Its an amazing place, I’d definitely recommend a visit. I believe you can camp in the park but it was never something I researched so not 100% sure. I’d say the best time to visit would be in the winter months. I went during summer and although amazing the heat was super intense (hitting 50℃) so limited the amount of hikes etc. The stars and the colorful rocks look absolutely amazing! Thanks for sharing! Wow, what stunning scenery. And it’s all so diverse too. This is definitely one for the bucket list! Its certainly a magical place!